It is uncontested that urban violence, fuelled by street gangs, presents new challenges to security. Big cities around the globe are increasingly witnessing the emergence of youth gangs in their poor neighbourhoods. Armed, tattooed young men dominate the images of these street groups, which are linked to heightened and fragile concepts of masculinity. But what insights do we gain when we consider gangs beyond the gender-sensitive focus on men, to illuminate female gang membership? For one thing, we need to acknowledge that the urban deprivation structures from which gangs arise are pertained by different gender realities. For another, young women play manifold roles in gangs as they offer spaces for gender performances beyond traditional role models. Those dwelling in urban slums are severely deprived in various dimensions, facing harsh living conditions. In particular, the lived realities of poor neighbourhoods are shaped by traditional gender roles that make women disproportionately vulnerable to poverty, social marginalization and violence. Economically, women have fewer income opportunities than men as they are more often located in the domestic sphere of unpaid care work. Socially, women are more excluded from public life and political participation and restricted in their social mobility, tied to their responsibilities in the family. Finally, women are disproportionately affected by gender-based and domestic violence. In the absence of state structures that assure a reliable order, in gang-prone areas women need to cope with gender discrimination and the parallel structures established by gangs. Since the 1980s the city of Medellín in Colombia has been one of the most famous examples of deprived urban parallel structures, ruled by gangs and characterized by a high level of insecurity. In such areas, gangs are deeply embedded in the everyday life of the community, forming a sort of alternative governance that provides economic, social and security features to their members. 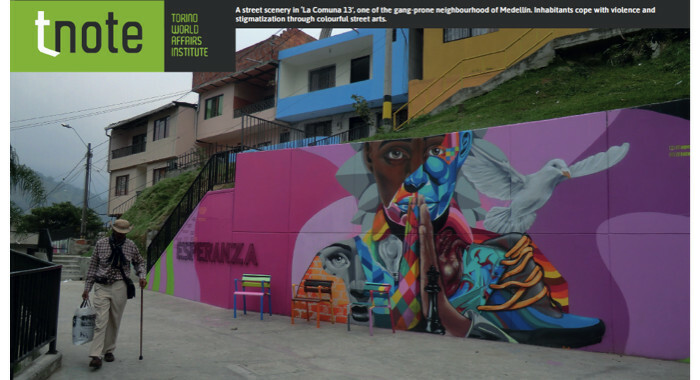 Although the visible street appearance of gangs in the neighbourhoods typically consists of young men hanging out at the corners of a gang´s territory to ensure that opponents do not cross its invisible borders, girls often do the exact same, albeit with less public recognition. Women join gangs from adolescence. Theirs is the classic pathway to gang membership: these girls come from socio-economically deprived backgrounds and difficult family situations and are burdened with a lack of perspective to escape marginalization. Often attracted by material status symbols such as motorcycles, the incentives of informal income opportunities and the social respect gangs enjoy in the community, young women affiliate with gang members in the hope of a better standard of living. While contact is often initially established through male members, once in the gang girls participate in diverse ways. One task that girls classically undertake from the beginning is that of regulating the plazas of drug trafficking in the city’s neighbourhoods. Each gang – depending on its size and territorial strength – has several plazas at its disposal that are run to an equal extent by male and female members. Storage of drugs and guns is the particular responsibility of the girls, as they are viewed less suspiciously by the police and are therefore searched less often. The strategic advantage of the inconspicuousness of young women is also used when it comes to cross-gang intelligence and the observation of other gangs’ activities along the invisible borders of their territories. In these ways, gangs take advantage of certain widespread gender perceptions to run their operational street business. Inside each gang, girls have differing status levels depending on their involvement in its activities and the responsibilities they are willing to shoulder. In this way their gender performance plays an important role. The closer the girls’ behaviour is to the traditional gender performance of the girlfriend role, the lower their social status within the gang. They might even be reduced to being a male’s trophy. The tougher and the more cunningly the girls act, the more respect they gain inside the group: in gang socialization processes, the adaptation and reproduction of masculinized power structures is required for women and girls to acquire status equal to that of male members. In Medellín’s poor communities, however, gang girls are often regarded based on their mere affiliation with the gang. Whether the respect they gain is based on a certain level of acceptance of the gang as alternative power or, rather, on fear depends on the degree of embeddedness of the gang in its surroundings. But it is normally influenced by both factors. However, it is clear that female membership in gangs is in the majority of cases a conscious and sometimes strategic decision. Membership provides young women with a feeling of belonging, a social space that offers them the opportunity to gain self-esteem and to position themselves in a harsh society. Being part of a gang conveys meaning and perspective during the troubled period of adolescence when the socio-economic background of the family is precarious or even violent. Facing violence in the family or in the community, girls find protection in gangs. The level of security of gang members, both girls and boys, is highly variable, as violence forms an inherent part of gang life. On the one hand, female members are protected by their gangs against outside threats and are less likely to become victims of gender-based violence from individual perpetrators in communities. On the other hand, socialization inside the gang is intensively shaped by violence. Hence, gang girls get involved in gang warfare, become targets of acts of retaliation and are more likely to commit violent crimes than girls who do not belong to any gang. Although they do so less visibly than boys, gang girls engage in violent encounters between gangs, function as extortionists, commit violent assaults and even fulfil the notorious role of the ‘sicaria’ – a member of the death squads of Medellín´s criminal structures, originated by Pablo Escobar and the Medellín cartel. Just like male members, when girls infringe the rules of the gang or want to leave the gang, they risk violent punishment or forced displacement. While gang membership at first contains the benefits of illegal income, social affiliation and protection, exiting a gang jeopardizes all of these. Female gang members who have taken on the role of girlfriend become especially vulnerable when leaving their partners, as in the aftermath they may be confronted by the entire gang, and they cannot rely on the same level of solidarity from their former peers. Today, many of Medellín’s neighbourhoods are still under the control of powerful gangs in which women and girls play important roles. This does not mean that gangs are not the spaces of heightened masculinity so often emphasized, but the empirical evidence of female gang membership needs to be taken into account when we analyse gangs and violent urban dynamics. Sidelining female gang membership has consequences. First, ignoring the deprivation of women throws them back on their own resources to cope with coercive parallel structures. Second, the public invisibility of gang girls fuels their delinquency as no attention is paid in policy to their strategic commitment to gang crime.